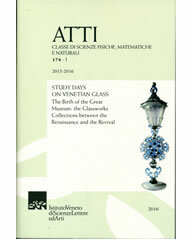 Home : Atti Classe Scienze Fisiche : Volume 174, fasc. I. Study days on venetian glass. The Birth of the Great Museum: the Glassworks Collections between the Renaissance and the Revival. Reino LIEFKES, A Pattern Book of the Venice and Murano Glass Company ltd.
Maria João BURNAY, Murano Glass Industry in the Portuguese Royal House Collection: Rebirth and Splendor.